Now comes a man. And one man is a small thing. This man gives an adjustment. The adjustment is a small thing. The adjustment replaces the subluxation. That is a small thing. The adjusted subluxation releases pressure upon the nerves. That is a small thing. Chiropractic holds to the philosophy that the universe and its inner workings have order and purpose. Nothing is a product of randomness or happenstance in our world. Planets circle the sun in a uniform orbit, a bird is perfectly suited to fly, a plant turns its leaves toward the sun and atoms are somehow held together. By observing all that is around us, it seems clear that an Intelligence has created and sustains the many wonders which surround us. Of all the wonders of nature perhaps the most amazing is Life. 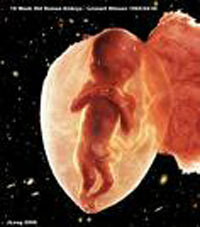 We all begin as one tiny cell which divides and divides to eventually form the trillions of cells of our body. From one type of cell comes nerve, bone, muscle, skin, blood, organs, and on an on it goes. Once these trillions of cells are formed they somehow know how to function in harmony to allow for a healthy you to exist. There is in everyone an ability outside of our conscious control that regulates the millions of functions occurring simultaneously within our bodies. Chiropractors call this Innate Intelligence. Innate Intelligence makes our heart beat, stomach digest food, cells replenish themselves and immune system fight off foreign invaders. Innate Intelligence has been bestowed to give the body a means of healing itself and maintaining health. It is well known that the control center of the body is the brain. Innate Intelligence functions throughout the nervous system relaying its commands from the brain, down the spinal cord and out the spinal nerves branching to all parts of the body. If the Innate is able to function unhindered, then the body is able to function at its optimal level. If any interference is added to the nervous system, then the ability of Innate is compromised which causes a state of less than optimal health or dis-ease. A subluxation (a spinal misalignment causing nerve irritation) is one very common interference to Innate Intelligence. Symptoms, or pain, are the body’s way of sending an alarm that something is wrong. To mask these symptoms without determining what is wrong is illogical. This is similar to cutting the wires to a beeping smoke alarm and assuming this solves the problem. For many people the focus shifts from finding the cause to relieving the symptoms. The goal of Chiropractic extends beyond eliminating symptoms. Our goal is to eliminate causes. Why is it that two people can be exposed to the exact same germs, and one gets the flu while the other remains healthy? It is due to a difference in the internal environment of each individual. One is a better host for a virus or one has a fully functioning Innate controlling the immune system. The mindset of our society has us believing that disease is a result of something negative coming at us from our surrounding environment (i.e. germs). Chiropractic holds that a state of dis-ease comes from an interference in our internal environment. If our internal environment is able to function at 100% as it is intended, then we have very little need for external intervention (drugs or surgery) to achieve health. Innate Intelligence has the ability to keep the body healthy; it knows exactly when and how to heal. The philosophy of Chiropractic is to help the body maintain its ability to heal itself by removing vertebral subluxations that hinder the function of the nervous system. Contact Higley Family Chiropractic today to make an appointment.